The "Schlieffen Plan" assumed a one-front war against France alone. In 1914 Germany faced the certainty of a two-front war against France and Russia. The "Schlieffen Plan assumed the Germany army had 96 divisions. In 1906, when it was written, the German army had 72. 1914 it had 68 in the west. The "Schlieffen Plan" stated expressly, twice, that if the Germans attacked to the east of Paris, between Paris and the border with Germany, that attack would be stopped on the Aisne River, or the Marne, or the Seine. To outflank those river lines, the Germans would need to move west around Paris. For that the Germans would need, in 1906, 24 divisions that they did not have, in 1914 28 divisions. 25-30% of the force needed to conduct the "Schlieffen Plan", approximately three armies, never existed. Moltke did not "modify" the "Schlieffen Plan". Schlieffen said, twice, that an attack between Paris and the German-French border would not work: it would be stopped on the Aisne, the Marne or the Seine. Moltke attempted to attack east of Paris and lo and behold, he was stopped on the Marne. Moltke did exactly what Schlieffen had told him not to do. 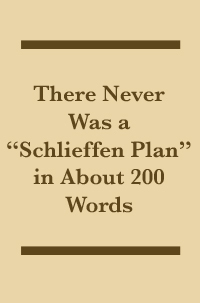 The Historical Society Article: "Was There a Schlieffen Plan?"